THE CHESHIRE DESIGN HOUSE: I dont want to be French I need to be France! 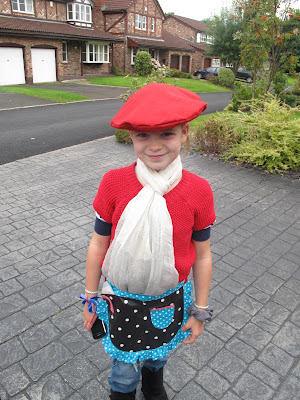 It was 8am and she said she had to go to school as 'France' so sorry for the very rough sewing I ran to the sewing room and made her a nice red beret, she put it on and loved it , I had already made a sample of a little 'kind of' French maids pinny so she put that on as well. Ohhhh, I said you look so French! to which she replied, MUM!!! I need to be France not French!! OK I'm off to do some sorting in the new SU room....while watching for my SU delivery of course!